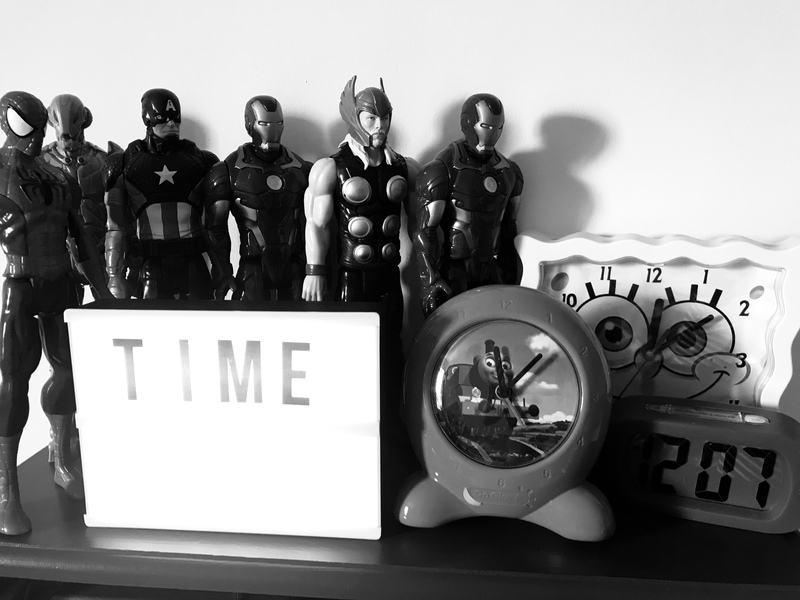 3 clocks, guarded by super heros to ensure optimum accuracy on par with the talking clock (is that still a thing? ), yet I still can’t get the small human to sleep in past 7. To be honest these days, with an even smaller human, I’m quite grateful if the first digit doesn’t go lower than a 6. From what I’m hearing there’s been a memo going round amongst the small human population as there are multiple terrifying reports of adults being forced to start their days circa 5.00 – 5.30am! Pre-small humans I didn’t even realise there were two 5 o’clocks in one day. The problem with waking up so early is that it feels like lunchtime by 9.30am and come 2.00pm the day has just been going on forever. However, there’s probably bugger all I can do about this ‘phase’ the small humans are going through so rather than be grumpy/frustrated about it I’m trying to use the extra time more positively. (NB – I’m not frustrated anymore but the grumpy is still a work in progress. I’m not a morning person!) The other day I’d done two loads of washing and was out walking the dogs with both small humans, before the preschool run at 7.30am in the morning. I don’t recognise myself! I don’t write this to brag about my household chores efficiency but rather to show that I’ve changed my habits and I’m using my time more productively. We’ve all got the same amount of time at our disposal irrespective of our status. We’ve all got 24/7, that’s the deal, so why do some people seem to have all the time in the world and others are constantly running around like headless chickens? There’s a quote doing the rounds at the moment “ You can do anything, but you can’t do everything.” How true is that? You’d go nuts trying and in the past I have personally suffered as a result of trying to do everything, to please everyone. It just doesn’t work and now I’m more ‘selfish’ with my time. I don’t over commit or do something out of a feeling of obligation. I’ve previously blogged about self-care and finding time for myself. About giving up hobbies because there just wasn’t time with everything else I needed to do. The reality however is that time will just keep on ticking away so why not take some time out for ourselves? In the grand scheme of a day what will happen if you put the baby down to nap (if you’re lucky enough to have bagged a napper) and then sit down for 5 minutes with a cuppa and a magazine before jumping into the chores? Nothing. And what’s more I bet you’ll feel a damn sight better. I used to feel guilty if I didn’t jump straight in but with practise I feel less so. I was always a creature of habit. I liked to do certain hobbies at certain times/nights e.g. going to the gym/classes. I liked to do things a certain way e.g. do the ironing all in one go. Initially when the small humans came along I’d get frustrated I couldn’t keep to my routine but now rather than fight it, let’s be honest what’s the point, I’m more flexible. I’ll go to a class if I have childcare, if not I’ll try to include some form of exercise into my day. I’ll make a start on the ironing when I can and perhaps do it in bursts, it will get done eventually but it won’t if I save it up until I think I can do it in one go. Then it’s going to eat into my evening time when the small humans are in bed and I’d rather be doing something much more fun, ironing does not float my boat! I’m also trying to slow up, to not plan as much, and really enjoy what is going on ‘now’. Another post doing the rounds at the moment refers to you only having 18 summers with your small humans and not to hurry them away. That delivers some perspective. Why are we rushing through life, onto the next thing? I’m already 4 summers in with Toby, I’ve got 14 left, and how many of them will he actually be excited to spend time with us as a family before he’s out with his mates or buried in his bedroom on a computer? At the moment the days do feel long (at least 36 hours) but I know the years are short and before I know it I’ll probably be looking back at these early starts as I try to convince a teenager to get out of bed before noon! Right now it’s summer, the weather is beautiful, I’m very fortunate to be on maternity leave this year, so I’m going to take the time to spend as much of it as possible with the people who mean the most to me. Enjoy the now. Don’t dwell on what has been (you can’t change that) or worry about what’s coming. It might not happen and if it does worrying isn’t going to solve it. It’s such a waste of time. Finding it hard to find time for yourself? Why not do a time grid marking out 24/7, entering the essentials e.g. work, sleep, etc and other essential activities then working out when you could go to an exercise class, nip out for a walk, read a book. Having a designated time might work for you or like me you might need to be more flexible and fit it in when an opportunity presents. Incorporate exercise into your daily routine involving the small humans. They’ll find it fun, you get to work out and you’re teaching them a good lesson. Check out my chat with Caroline Jepson, personal trainer, in my private FB chat group. Start a task even if you know you won’t be able to finish it. Doing something in bursts means it will get done eventually but putting it off until you can do the whole task in one go might mean eating into time when you could be doing something more fun. Plan a date night or night out with the girls, write it on the calendar then make it happen. If it’s not written on the calendar in our house it doesn’t happen! Get an alarm clock for the bedroom and leave your phone downstairs overnight. I reckon I’m going to bed and more importantly to sleep approximately 30 – 60 minutes earlier each night now I’m not wasting time scrolling on social media. We’ve been slowing down and doing less for some time now. It’s been really good for us as a family if 8 making time for each other and making the most of the precious time we have with the kids. Thanks for sharing. This is somehow such a difficult concept but I think your tips are an excellent start. At the moment I am working on living in the now. This has proven a challenge but I am already noticing a difference! Thanks so much for your comments. I agree, it’s really hard to live in the now but something that’s been a work in progress for me for some time now. Absolutely. We all get the same 24/7. I reflect and see I was always wishing my time away for the next big thing. Now it could do with slowing down!